A Japanese spa is offering the perfect gift for Valentine’s Day — cocoa baths. Chocolate lovers can immerse themselves in water mixed with cocoa and fragrant bath powders. 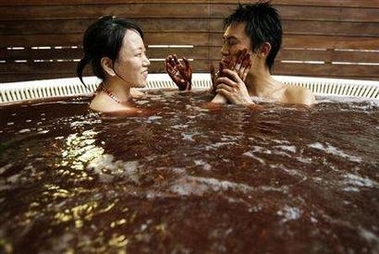 The spa says staff can pour creamy chocolate over the bathers, who can then smear it over the bodies or lick it off. “This bath is my Valentines Day gift for him this year”, says Mayumi Uekusa, who travelled more than two hours with her boyfriend to the Yunessun spa, north of Tokyo. If you’re confused, Japanese women have long been the ones to give their guys gifts on Valentine’s Day. This entry was posted on Thursday, February 15th, 2007 at 5:01 pm	and is filed under Funny Junk, Interesting Stuff, Wonderful Things. You can leave a response, or trackback from your own site.